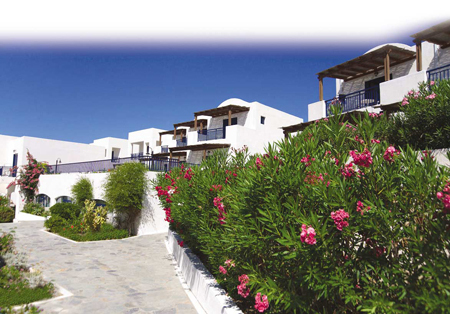 Lakitira Resort and Village lies gracefully on a land of around 50,000 m2 on the southern coast of Kos. Embraced by the sea, at a privileged waterfront location, this family oriented resort offers two sandy beaches with crystal clear waters and beautiful gardens. The Resort is ideally situated at a comfortable distance of approximately 4 km off the nearest village (Kardamena), thus combining a tranquil location with easy access to a lively area with many restaurants, bars and shops. The Resort has a delightful collection of double guest rooms, family rooms and suites, all fully renovated in 2008, most of them with lovely sea view. Family rooms have a bedroom and an extra area for kids and are located on the ground floor, with direct access to the gardens. The suites feature a master bedroom and a living room, a walk-in closet, a marble-lined bathroom with a bathtub and a separate shower cabin plus a separate W.C. All rooms have satellite flat TV, air conditioning, phone, safe, tea/coffee making facilities, bathroom amenities and fridge. Lakitira has 4 restaurants and 4 bars. Guests enjoy the rich buffets at the Terrace Restaurant, try our delicious pizzas at the Trattoria di Mauro, stay true to their healthy diet with a fresh salad at the Breeze Snack Restaurant and taste Greek “mezedes” at the Plateia Tavern! For refreshments and beverages, options include the Stars Main Bar, the Barefoot Bar by the Pool, the Breeze Beach Bar and the Aces Tennis Bar. The Resort has three swimming pools, of which one is only for children. Sun-beds and umbrellas are available at the beach and by the pools, at no charge. Lakitira offers the finest sea sports and tennis coaching and facilities in Kos. Our award winning Tennis Center has 11 courts, is endorsed by the Lawn Tennis Association and is managed by Service Line. The Sea Sports Center has more than 100 sailing crafts and offers RYA training. Also available: a football field, a beach volley court, daily fitness lessons, diving courses (PADI) and mountain bike tours. All sports activities are managed by Mark Warner, specialists in family and sports vacations.